← Get Out of Jail Free! Randy told me that being at Lake Mead is good for his soul. Having grown up in Tucson, he loves the blue skies and landscapes of the desert southwest. Lake Mead, the largest reservoir in North America, has both. He certainly had to work to get us here! Because of repeated snow and rain in Boise, we had two inches of ice on the top of each of our four slide-outs. He spent hours on Sunday chipping and washing the ice away so that our slides could close Monday morning. We left Boise at 6:00 a.m. and arrived in St. George, Utah 12 hours later. He drove the entire way. (Yes, I offered.) That is 3 times the length of our typical driving day but we had to go that far south to get out of frigid temperatures. The following day we had just a three hour drive to get to Lake Mead RV Resort, 25 miles from Las Vegas. Dedicated in 1964, Lake Mead National Recreation Area is our nation’s first national park dedicated to recreation. Thirteen percent of the recreation area is water with the rest being portions of the Mohave Desert. 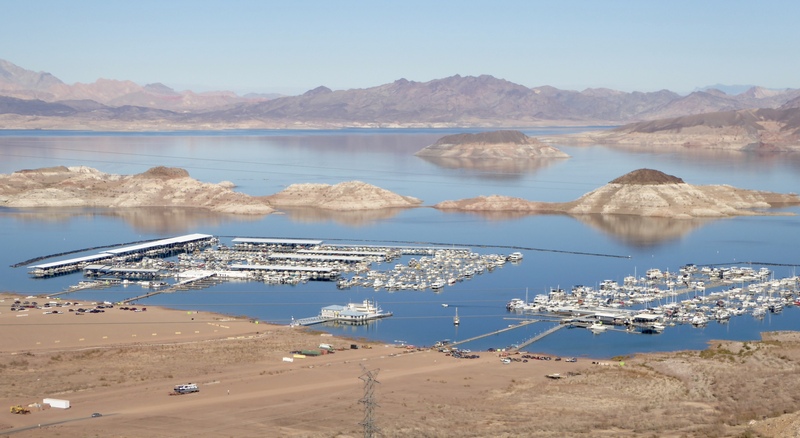 The Lake Mead RV Resort is operated by a concessionaire and our site is magnificent! We are paying a discounted rate of $45 per night for our lake view site (about 50% more than typical) and it is worth every penny. We have a wonderful view of Lake Mead through 8 of or our 11 windows. The resort is very well done in other ways too. There are utility hook-ups on both sides of the lake view sites! 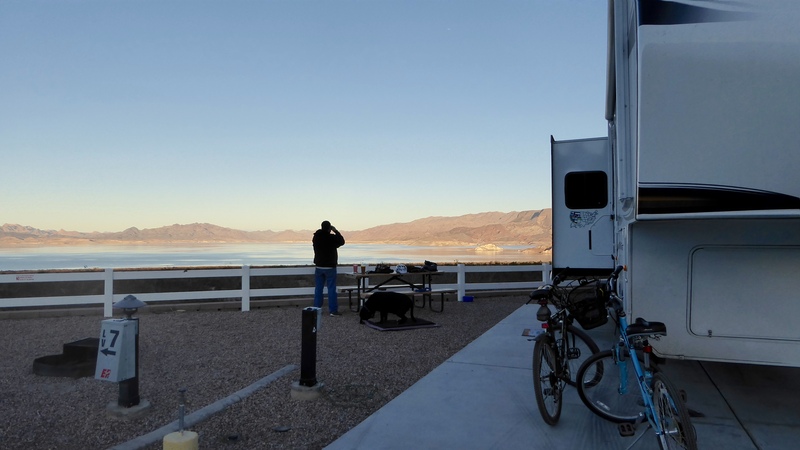 A motor home has a big window in the front and a trailer’s big window is likely in the back and with hook-ups on both sides, either RV can be accommodated, while preserving the great view. We have never seen this before. The resort even supports recycling – something we don’t see nearly as often as we’d like. Because we view campgrounds through the lens of “would we want to volunteer here?” we spoke with Jerry, the camp host. He served 5 deployments in Iraq and is now spending time volunteering here at Lake Mead and going to culinary school on the GI bill. He says that camp host commitments here are for a full year. There are many people interested in volunteering here in the winter, but not so much in the summer heat! This campground also includes a “vacation home” mobile home park, begun in days past. Owners can live on-site for 180 days per year. The National Park Service is trying to transition away from having mobile home parks within the national parks. 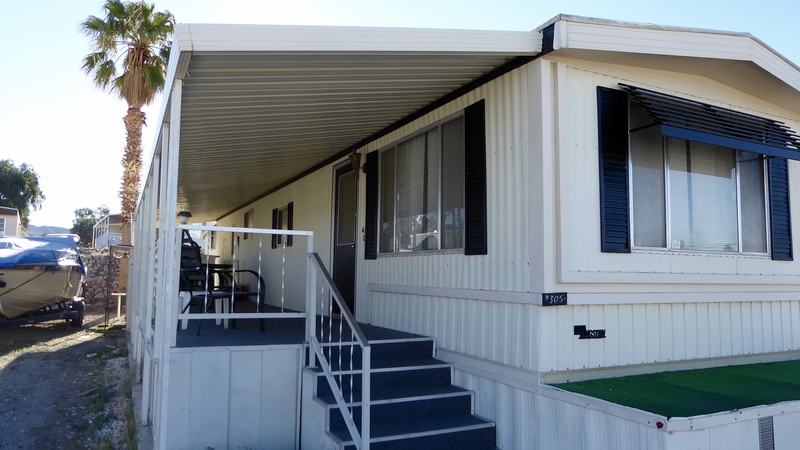 Those who already own mobile homes are allowed to keep them as long as they maintain their homes and site leases. These mobile homes may be bought and sold but no new mobile homes may be moved in. Currently there are three homes (vintage 1969, 1971 and 1991) for sale, five abandoned homes set for demolition, and a few vacant lots. These lots, and future ones that become available, will be repurposed for regular recreational vehicles like ours. There will be even more magnificent sites at Lake Mead! 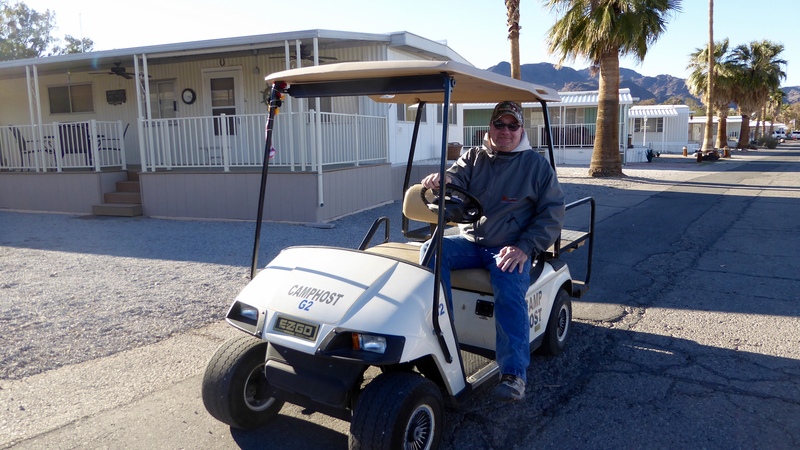 We have enjoyed walking around the RV resort and adjacent campground. One afternoon, we walked the long way down to the water’s edge but only Elko felt like wading in. Although boating activity is huge in the warmer seasons, we saw very few boats in use during our stay. 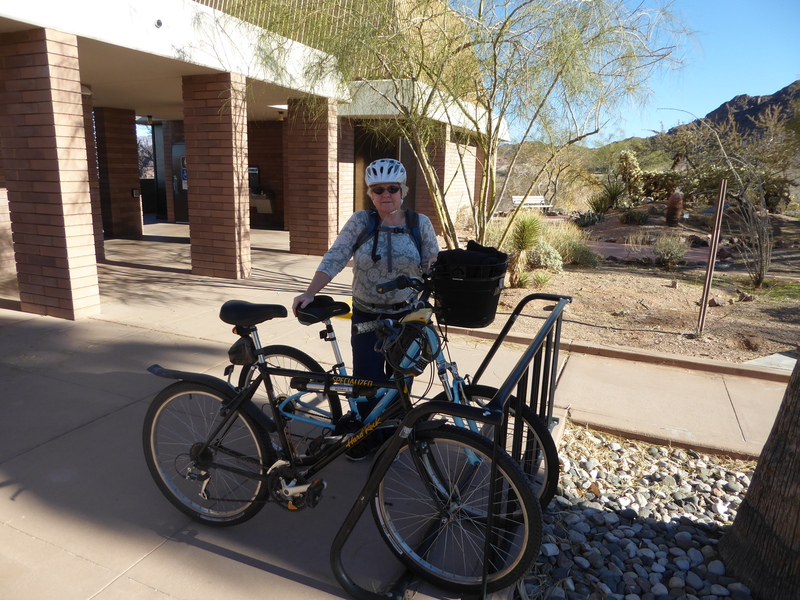 Our big event was to bike to, and along, the Historic Railroad Trail at Lake Mead, part of the National Trails System. 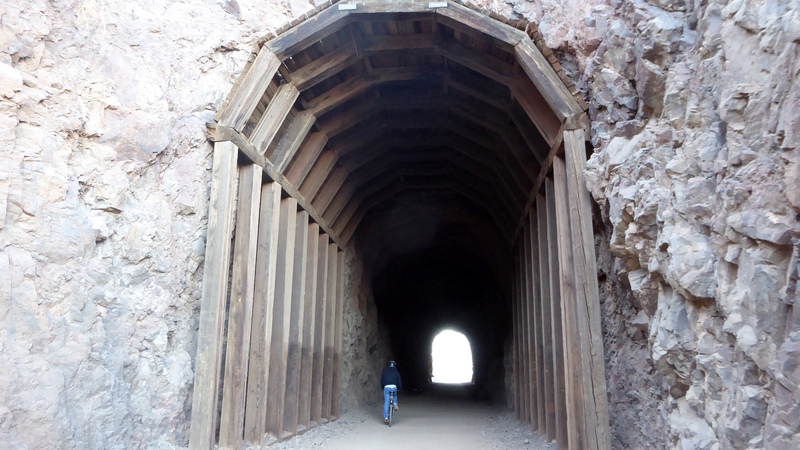 This 3.7 mile trail is part of the 30 mile railroad grade used during the construction of Hoover Dam. The trail connects the Visitor Center at Lake Mead National Recreation Area and the Visitor Center at Hoover Dam and is open for hikers and bikers. Along the way we saw an area in the desert where the workers and families lived in the make shift community of Ragtown in the 1930s while working to build Hoover Dam. We learned that Hoover Dam workers came from every state in the country with the most from Nevada and the least from Delaware. The Historic Railroad Trail goes through five tunnels. These tunnels were blasted/built in six months. They were built to be exceptionally large, 18 feet wide and 27 feet tall, to allow for the transport of construction materials to the dam site. The original supporting timbers were destroyed by fire in 1990 but have since been replaced by the park service. Copper roofed building is the new visitor center. 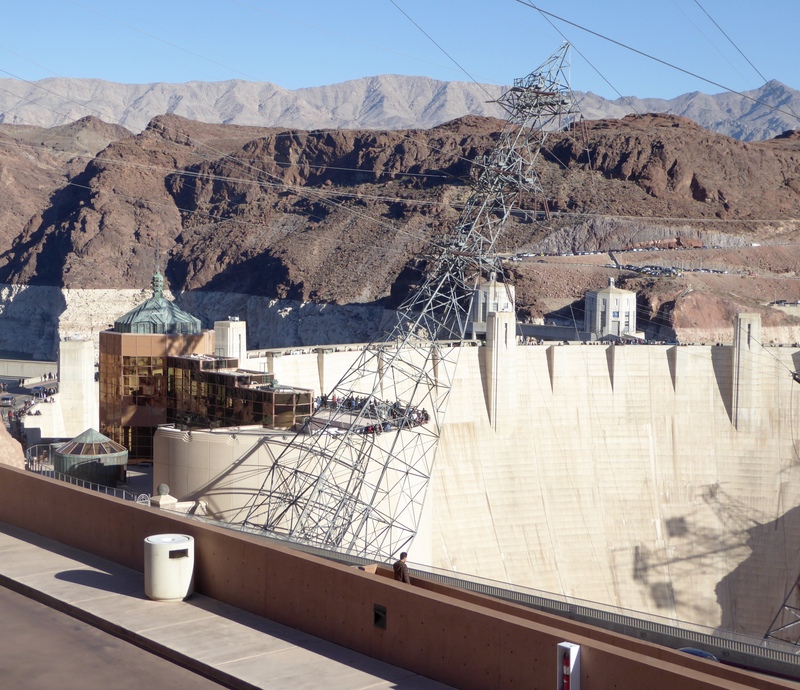 We have driven and walked over Hoover Dam several times in the past. We even went inside the dam on a tour many years ago. With the new bridge in place, most traffic avoids the dam itself but the area was still very busy with visitors. There is a parking structure, a large gift shop, a restaurant, and a new visitor center. Tours are still available. Since we still had the trek back home we just enjoyed the view for a while and saved more exploration for another someday. Although the Historic Railroad Trail itself is fairly level, the hard parts (for me anyway) were the elevation changes in and out of the visitor centers on each end. From our site, we had a 3 mile incline to begin the ride and I didn’t enjoy that part of the trip at all. As encouragement, Randy reminded me that we’d have that same 3 mile decline on the way back. As a reward for our efforts, we were hoping to go the entire 3 miles down without having to pedal at all but had the misfortune to meet a vehicle at one of only two crossroads. Bummer – we had to pedal about 4 times to get going again! All together we rode 11-12 miles – and had the aching body parts to remind us that we really should ease into these things! What a difference a day and a half of driving makes! I’m glad that the two of you are out and about once again. It is so smart of the resort to place hookups on each side of the site. Somebody was thinking when they came up with that plan. It feels wonderful to be out and about again – on the road at the moment driving to Yuma for our month there. I hope we have the opportunity to connect with you and Teri again in 2016. So glad you safely got to some place warmer! I always love your posts and all the fascinating facts about your current area. Keep ’em coming! Thanks Karen. We see it is 9 degrees there. Brrr! We are driving to Yuma today to begin our month long stay. We’ll see what there is to explore and write about there! How was the weather in St. George! One of our top destinations to retire. There are so many parks to see. Zion, Brise, red canyon. Glad you are enjoying that area. Happy New Year to you, safe travels and keep the posts coming! We love southern Utah but were just there overnight this time – then on to Lake Mead for a few days. We drove to Yuma today and are getting settled in at a snowbird park for a month. Everyone seems very friendly. I think it will be great. All the best for you there in the cold! Ha! We love Boise- but are so glad we are in Yuma (moved here today) where it is suppose to be 70 tomorrow. Stay warm!